The Partnership is a joint labor-management organization that provides education and training services to NYS agencies and CSEA-represented employees, and is funded through the collective bargaining agreements between the State of New York and the Civil Service Employees Association (CSEA). A four-member Board of Directors, made up of representatives from the NYS Governor’s Office of Employee Relations and CSEA, provides policy guidance to the Partnership. 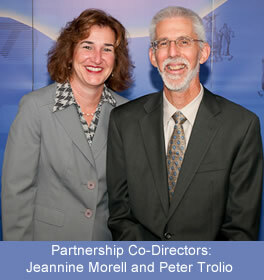 Co-Directors Jeannine Morell and Peter Trolio oversee the Partnership’s programs and services. Labor-management committees work with Partnership staff to learn how to strengthen their structure and relationships to address issues of mutual concern more effectively. New York State and CSEA have a history of working together to improve organizational effectiveness and advance the quality of work life for CSEA-represented New York State employees. Collective bargaining agreements between the State of New York and CSEA have maintained a strong commitment to providing education and training programs that make a difference for employees, management, and CSEA leaders. Since the establishment of the NYS & CSEA Partnership for Education and Training, a range of employee and workforce development needs have been met at hundreds of agency worksites throughout the state. The Partnership’s programs and services continue to invest in the job skills needed by employees and offer innovative approaches for enhancing labor-management relations. We invite you to contact our staff to find out how the programs and services described in this brochure can serve your education and training needs. Field Services – Support the Partnership’s mission in building effective labor-management relationships between agency/facility managers and CSEA leaders. Field staff are often the important first link for CSEA and management representatives seeking both information and assistance from the Partnership. Field staff promote Partnership programs and services through presentations, meetings, and informational events. Help employees improve reading, writing, and math skills, learn English for speakers of other languages, learn introductory Spanish as a second language, and enhance college preparatory skills. Provides reimbursement for certification and licensure examination fees that are job- or career-related and lead to certification or licensure for a state occupation. Offer confidential individual advice and referrals for employees about educational planning, education financing, alternative approaches to further education, and obtaining a high school diploma. Allow employees access to over 2,600 Skillsoft courses. Employees can also enroll in certificate programs where they select a series of online courses to enhance job-related skills and career mobility opportunities. Offer a range of job-related training topics. With supervisory approval, employees can apply for courses scheduled in their geographic area. To increase participation in courses while limiting time away from the job, courses are also offered using a webinar format. Provide educational benefits to employees, enabling them to achieve greater career mobility, qualify for promotional opportunities, improve job skills, and prepare for future workforce needs. Employees matriculated in LPN and RN programs may access additional Targeted Tuition Benefits. A two-year training and development program that provides employees with classroom and hands-on training in the following skilled trades: carpenter, electrician, mason and plasterer, plumber and steamfitter, and refrigeration mechanic. Provided statewide by three Field Associates who promote the Partnership’s mission in building effective labor-management relationships between NYS managers and CSEA leaders. Field Associates are often the important first link for CSEA and management representatives seeking both information and assistance from the Partnership. Foster cooperation between CSEA leaders and agency managers through labor-management committee development training and custom consultation and facilitation. Local, regional, and statewide labor-management representatives work with Partnership staff to learn how to strengthen labor-management relationships and reach understandings for mutual gain. Support joint efforts of NYS agencies and CSEA locals to achieve the goals of increased organizational effectiveness, improved services or work processes, and enhanced job skills. Provide funding for NYS agencies and CSEA locals to purchase equipment for break rooms, conduct employee recognition programs, implement health and wellness projects, and improve working conditions. To receive grant funds, labor and management representatives must demonstrate active cooperation in addressing worksite issues. Allow agencies facing unique safety and health needs to apply for grants to increase the effectiveness of safety and health committees, improve workplace safety and health programs, reduce employee injuries and illnesses, and enhance organizational safety and health knowledge. Help meet the training needs of a particular position or title for CSEA-represented NYS employees. NYS agencies and CSEA locals can use the program to support workforce development and succession planning needs by accessing additional tuition benefits. Allow NYS managers and CSEA leaders to jointly request training at agency and facility worksites in the following categories: Adult Education Basics; Individual Development; Interpersonal Communication; Labor-Management Services; Language Skills; Math Skills; Safety and Health; Trades, Operations, and Maintenance; Work Management; and Writing Skills.